Starring: Santi Serratosa and Mariona Castells -body percussion-, the groups Ghana Man and Tam Tam Gospel and a session of dance in India. The project Breaking Borders attempts to network among women living in Vic, so they can play an active and important role in the city. The Initial phase of the project has been aimed primarily at improving the spoken Catalan of Moroccan, Punjabi and Ghanaian women through oral communication workshops called "Let's talk." Learning about the surroundings has played an important role since the start of the project. 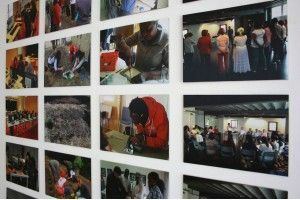 Participants have visited various town services and facilities such as the Guardia Urbana precinct, CAP de salut El Remei [health centre], the Joan Triadú library, or the University of Vic. 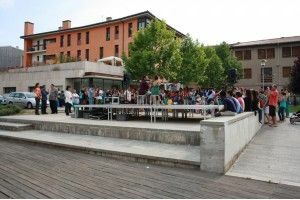 As a parallel activity, and coinciding with holidays or celebrations, there have been been more relaxed participatory workshops on wool within the Mercat del Ram (traditional easter market), the "gatherings for weaving" on Wednesdays or International Women's Day with the "Dona mà" (hand woman) project. The second phase of the project began in April with a range of workshops for all citizens who share in common the idea of cross-relation, training, dialogue, collaboration and social cohesion. Promoted by Ajuntament de Vic through Oficina d’acollida, VicDones-SiadOsona, Ciutadania, Participació ciutadana i Cooperació al Desenvolupament. With the support of the Fundació La Caixa. Five groups were organised in different strategic districts, taking weekly two-hour sessions in learning and practicing spoken Catalan. Communication method has been the basis of these sessions via role-playing games, music, visual material, crafts, group work, and so on. In different methodological units, aspects of women's everyday lives have been taught, such as how to say hello and goodbye, vocabulary for surroundings, body parts and health, food, trades and jobs, school, feelings ... 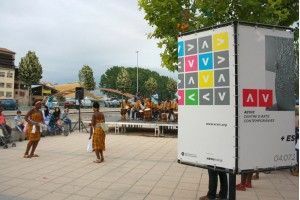 Simultaneously, emphasis has been placed on one side to promote issues such as self-esteem, sense of belonging first to Catalan society, but also the city and its districts. and on the other hand, to confront their shame, their fears and their uncertainty within society and at work. It is important to note the active participation of the 76 women throughout the programme, who were punctual, and took few absences; that they were very committed to the activity. Many of them said, "we are a club", "we are friends" ... for them it was very important to find these areas and to feel part of a group. "These hands are full of creativity, feelings and desires which we as women want to express. We asked the world what has been written on them: we think of ourselves, and of our daughters, and makes us think of women suffering inside and outside our borders." 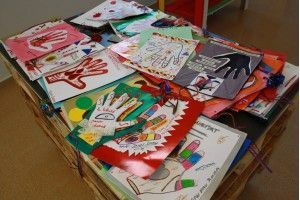 For the occasion of March 8th, "International Women's Day," participants in "Breaking Borders" had the idea to paint each of their hands. They agreed that the hand of a woman has great symbolic value because it expresses affection for loved ones, caring for children or the elderly, the marks of work, strength ... it is a place where a lifetime of experience is stored. Dona Mà comprised three sessions in which participants could discuss the problems experienced by women around the world, and the realities of injustice experienced by different cultures, the progress in rights issues which have been achieved, and what still needed work. 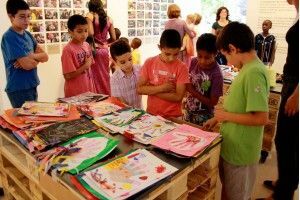 Dona Mà project was open to all citizens, coinciding with International Women's Day programming. Within the main activity of commemoration, the hands where exhibited at ​​the entrance to Ajuntament de Vic, and in the Sala de la Columna; latterly they could be seen in the lobby and at the Oficina de VicDones, and in the Oficina d'Acollida. The activity "awareness of the surroundings" was conducted every Friday morning at 10:00 - 12.00. The main objective was to promote the services, organisations and resources in the city firsthand. CAP RemeI services, the local police, civic agents, the municipal library, the further education classroom, the main Council building and the department of education were visited. There was also a session on rights and duties of citizenship, and also about Catalonia. Within this framework, students at UVic Social Education organised a tour for women participating in the project to learn about different areas of the University of Vic. 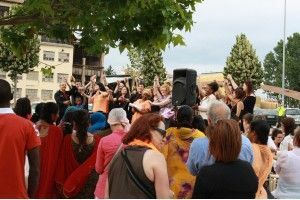 A large percentage of women participating in "Breaking Borders" had never been in front of a computer, and for many of them this was difficult to learn. So they did not suffer social exclusion as a result, 8 sessions of digital literacy were organised on Fridays, where they could learn the basic notions of computer use: using the mouse, creating a folder, saving a document or sending an email. March 8th is a symbol for women on five continents. Around the world, every woman is exposed to the experience and suffering of inequality and/or violence. To foreground and make visible the diversity of women from different countries and in this case, those women living together in the city, as part of International Women's Day, a total of 23 people, including nine women from "Breaking Borders", participated in the event "Reading Women" held in the Sala de la Columna of Vic's City Hall, where any woman could express their thoughts, feelings, wishes and desires. As part of the movement "Urban Knitting", which has the oibjective of intervening in public space using knitting to modify, cover or dress up urban elements, "knitting meetings"were created. 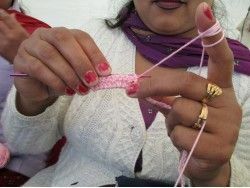 Every Wednesday at Civic Center Can Pau Raba, morning and afternoon, a group of people met who were willing to share knitting or crocheting in company, exchanging techniques and experiences, and participating in interventions in public space. The "knitting gatherings" are open to all with no need for prior registration, only the desire to learn and share. Everyone must bring their material (crochet needles, wool ...) to spend a few hours sharing the pleasure of knitting. Meetings have been promoted by the city of Vic, in conjunction with the Occupational Therapy Degree at University of Vic. 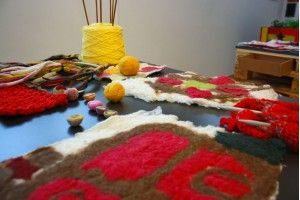 The booth "From a lamb to a sweater" was a participatory, dynamic space for learning and exhibition, themed around the process of transformation of wool and knitting. Over the three days of the Mercat del Ram, participants could experience the process of weaving and processing wool, all the way from shearing, washing, carding, spinning, to eventually seeing how to use it to make felt. 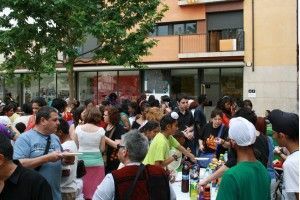 The Talleret del Clot used the space for various activities for children and adults, as well as participating actively in the event. As part of the event, the Occupational Therapy degree course at UVic organised a training and demonstration workshop to display and test different ergonomic materials for the use of people with mobility problems or pain when knitting. "Breaking Borders" was planned in two phases. The initial phase worked with newly-arrived women, promoting the Catalan language, and helping them learn about their surroundings. 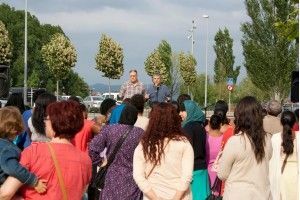 In its subsequent phase, the project was opened to the general public through workshops aiming to incorporate some women who had participated in the first phase, since they now had basic fluency in Catalan. A series of workshops were organised to provide spaces of learning, interaction and social cohesion. Making a repair on a small piece of furniture, painting a wall, fixing a lamp or hanging a picture seems only to be reserved for men. Nevertheless, these are easy tasks, requiring only a minimum of knowledge and the right tools. 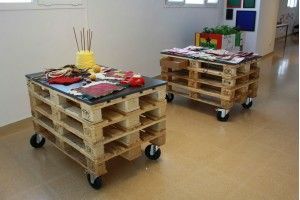 The workshop "Easy DIY" took place ​​in 10 practical sessions at the Casal Mossèn Guiteras, a good place to share, to work together, and to have an enjoyable time. A workshop of five sessions to learn the basics of making dress patterns, and also for women living in Vic from different backgrounds to share creative ideas. The class took place at the Atelier Trueta, with two teachers from Cosidor Pas a Pas ("Sewing Step by Step") at the Casal Claret. Among the basics learned by participants in the horticulture workshop were; knowing what to plant, what vegetables are in season, or when to irrigate or to combat a pest without using chemicals. The Casal Mossén Guiteras provided a garden, a space for education and experimentation, with the objective of sharing and forming relationships between people and organisations around a common space. The development of information and Communication Technologies (ICT) has had a profound effect, changing all areas of society: interpersonal relationships, the workplace, leisure, the media, administration... many daily activities are changing constantly under the influence of evolving technologies. The digital literacy workshop open to the general public offered resources and ideas for activities to work on computer operation skills, and to start learning basic ICT skills. Walking is a relaxing activity, allowing us to discover and enjoy the environment without a rush. The proposed workshop was intended for family participation. Participants, accompanied by a trainer from the Unió Excursionista de Vic, (Vic Ramblers' Union) met and walked to different natural areas around Vic. Over four Saturday mornings these walks have turned into a “space” for leisure, education and interaction. To be part of a choir or theatre group is a challenge for many people who may be afraid of taking the first step, even though they might wish to participate. Many people feel it is inaccessible to them, because they are uncertain whether or not they may need basic skills, the good looks or overall availability to join an already established group, and so may shy away from taking part. 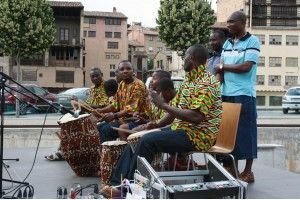 Music is a means of interaction and social cohesion in which everyone plays their part. Two participatory sessions were planned to experiment with Gospel singing with the choir Tam Tam. Extremely good results came from the experience, and participants enjoyed the sessions very much.